Algerian Jews shine by their absence from the Algerian press. But when they are mentioned, it's actually pretty funny, almost hilarious. Some myths I've heard include that Algerian Jews number by the thousands, perhaps hundreds of thousands in Algeria, that their beliefs are held secret and that they pretend to be Muslims and practice their faith in secret. A somewhat annoying page called “Juifs d'Algérie” probably managed by a Muslim who has a healthy obsession with Jews but is ambiguous about his religious beliefs and seems to pretend to be Jewish when interacting with commenters. The page includes no allusions to Algerian Jewish communities who are largely based in France and in Israel, seems not to refer to the dying Algerian Jewish culture, although he does mention that Synagogues have been abandoned in one post. The page seems to celebrate Algerian Jewish food and culture, although his greetings mixinig Hebrew and Arabic are a bit awkward. His knowledge about Judaism and Algerian Jewry also seems to have gaps, and when he answers commenter questions it almost sounds like he's trying to convert them to Judaism. He celebrates Jewish Algerian culture very little, except for that culture of a very distant past, and except to celebrate the fact that Alice Fitoussi, an Algerian singer of Jewish descent, was the only Jewish singer who sang Islamic chants. So good Jews are Jews who convert to Islam after all. Part of being Jewish is you go through a Bris, then a Bar Mitzvah, every Sabbath you're reminded of being Jewish and you celebrate several holidays a year, keep Kosher, attend Jewish weddings and funerals, and other stuff. 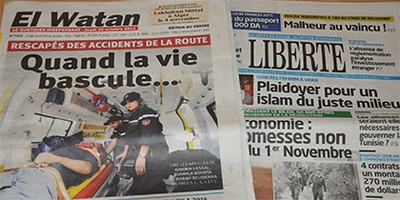 Not in Algeria, according to Algerian newspaper El Watan. An article mentions “Naim” a young “Jewish” adult whose parents never told him he was Jewish or showed any sign of the religion. So his parents apparently skipped all the holidays. He seems excited about his newly discovered faith, and wants to be a rabbi. Another article mentions a “secret Jew” who marries a Muslim woman and secretly worships “with friends” in an appartment, “behind a curtain.” He was caught, sent to prison and his wife divorced him. I thought the story was funny, but shows the prevalent belief among Muslims that Jews lead double lives, Mulsim in public, Jewish at home or within deep beliefs. There are no active synagogues and there is no organized Jewish community in Algeria. Historical sites are mainly dealt with by French Jewish organizations to protect whatever remains of Jewish hertiage in Algeria, mainly Jewish cemeteries. What I gather is the Jews present in Algeria are mainly expats, some Tunisian Jews, probably no post-independence second or third generation Algerian Jews. The only public Algerian Jew was a half-famous, half-Jewish documentary film maker who is the only other person to have written an article about contemporary Algerian Jewry. Jews tend to live in isolation and because most of them are expats from different countries who only briefly get posted to the country, there are no efforts to organize a community.